As a mother, I can only hope that my daughter survives the landscape of violence we have created for her to live in. This semester, I assigned Jo Ann Beard’s seminal essay “The Fourth State of Matter” in my freshman seminar course on first-person storytelling. With it, I also issued a brief content warning: The essay recounts a university shooting in graphic detail. The shooting took place in 1991 at the University of Iowa physics department, where a disgruntled graduate student named Gang Lu killed five university employees, and then himself. At the time, Lu’s rampage kept company only with incidents like the Kent State Massacre in the extent of the violence on a college campus, and Beard’s heartbreaking account (she had worked and been friends with several of the victims) shocked me when I first read the essay as a college student myself. Even 10 years ago, when I began teaching the piece, students often reacted with horror when characters they had come to care for were killed in Beard’s meticulously recreated scene of the crime. Some years, I just didn’t assign the essay, feeling too burned out on the emotional tax of analyzing it. Just 24 hours after the shooting at Umpqua Community College in Roseburg, Oregon, I came to class expecting to facilitate a heavy discussion of Beard’s essay—anger, fear, politicization, arguments about mental illness or gun control. But the response I got from the students in the class of 2019 can be summed up thusly: And? Don’t get me wrong, they loved the essay and were moved by its content and narration. They were particularly drawn to the way Beard describes caring for her dying collie, and her drollness about her failing marriage. And of course they were deeply sad when Beard’s friend, Christoph Goertz, is the first one killed by Gang Lu—Goertz’s character has, by this point in the essay, been developed with great affection by the author. But were they outraged? No. They weren’t even surprised. These are students who were educated mostly in the post-Columbine years of metal detectors and random locker searches and active shooter drills that are now simply part of our children’s K-12 years the way fire drills were part of mine. Because the class is all about telling true stories, the students offered up their own: the many times their schools closed because of vague or specific threats of violence (bomb threats, target lists, etc. ), the profiling of students of color when the police would infiltrate the hallways looking for guns or drugs, the wry jokes they told as they crawled beneath their desks for another drill that announced the strategy’s basic ineffectiveness. I’m a mother myself now, and my daughter, almost 2 years old, will enter preschool as early as next year. It’s impossible now to imagine her education being devoid of such training exercises; I only see the likelihood that preschoolers, too, will be taught the same drills. Gun violence in America has regularly found its way into the most benign of settings: movie theaters and bible study groups, elementary schools and facilities for the developmentally disabled. My college students reflected only the inevitable resignation to violence I fear my daughter will learn by the time she’s 5, as important and commonplace a lesson as simple arithmetic. I am terrified by my own growing numbness in the face of more violence and utter lack of interest on the part of Congress to act for Americans’ safety with strict gun control laws. I feel President Obama’s heavy bitterness at having to issue yet another public statement about the chilling outlier status the U.S. has when it comes to mass shootings and lack of restrictions on obtaining firearms. I can barely muster the energy to post a status or an article on Facebook because I am exhausted and depleted by a conversation that continually leads nowhere. But I am even more terrified, and horrifically sad, at the idea of raising another generation that understands mass shootings as an American tradition. That yawns while reading an essay about violent deaths in classrooms or theaters. What’s that old saying about self-fulfilling prophecies? I keep wondering if building a society in which killing one another with the most advanced technological efficacy available will, or already has, become a self-perpetuating cycle of violence. Nearly three years ago now, The Atlantic published findings on how the very design of weapons like pistols and assault rifles have an ethos that changes the ethos of whoever is holding the gun. “To someone with a gun, the world readily takes on a distinct shape,” Evan Selinger writes. “It not only offers people, animals, and things to interact with, but also potential targets. Furthermore, gun possession makes it easy to be bold, even hotheaded. Physically weak, emotionally passive, and psychologically introverted people will all be inclined to experience shifts in demeanor.” Such claims corroborate the larger idea that our technologies teach us how to use them—it’s no accident that our Internet-age metaphors for thinking include the brain as a database, for example. I picture the schools of my daughter’s future—lockdowns and drills, surveillance and security guards, teachers wearing bulletproof vests beneath their Oxford shirts—and wonder what their ethos will teach her about her world. I wonder what metaphors this world will inspire for her to best understand and make sense of it. Part of what made Gang Lu’s killing spree at the University of Iowa so awful was that professors like Christoph Goertz were, in fact, Lu’s advocates. Lu was passed over for a prestigious dissertation award, which was the alleged source of his anger. But as a professor, I can easily imagine the hours Goertz put into advising Lu’s dissertation—the many times he must have read and commented on it, the conferences he had with Lu, the recommendations he almost surely wrote. 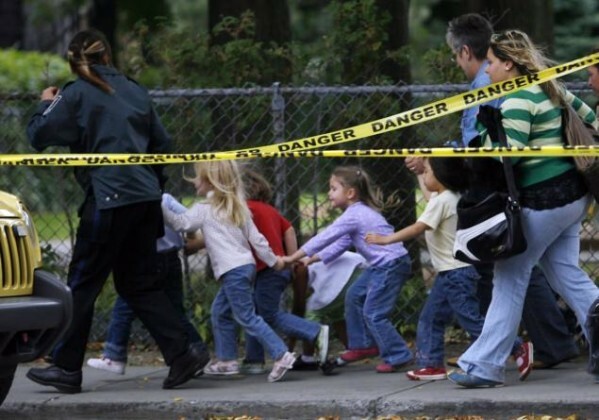 I grew up with the distinct notion that my teachers were, in nearly all cases, on my side, ready to help and protect me, and of course, we saw extreme evidence of that at Sandy Hook as teachers shielded their students with their own bodies, and died for them. But in a world where we can’t assume safety anywhere, how can we assume one another’s intentions? If my daughter sees a teacher donning a bulletproof vest, does she not learn an implicit lesson about expected victimhood? And if a teacher expects she could be a victim of gun violence, well, could that add to the sanctioning of such violence? Does a teacher wearing a vest suggest that she already sees herself as someone’s potential enemy? Parents today are either chided for giving their kids too much freedom, or for helicoptering and hovering over them. I find myself constantly inside impossible choices. I don’t want to be ruled by fear and teach it to my child. But I am daily given reasons to be afraid, of religious extremists, yes, but just as much of the common American with a complex humanity who is given enthusiastic access to a weapon with violence encoded into its making. My daughter is about to enter schools where these fears will be reflected, amplified, and institutionalized. An implicit education is already becoming explicit. She will learn that people can buy guns designed to kill other people, and her school will teach her what to do when that happens. And unless something changes—unless we use our votes to eradicate politicians beholden to the insidious rhetoric of the NRA, an association to which my grandfather, a respected gunsmith, was a lifelong member—it will happen. Have you heard the one about Chekhov’s gun? My grandfather once shot through the ceiling of his home because even responsible gun owners are still human, still fallible, and holding a piece of equipment made to fire bullets with astounding speed and force, that does what it is designed to do no matter the intention, skill, or mood of the person holding it. The part that breaks my heart, though, is that my daughter, like my current students, will not be surprised. She will have long anticipated the gun going off. As her mother, I can only hope that she survives the landscape of violence we have created for her to live in.